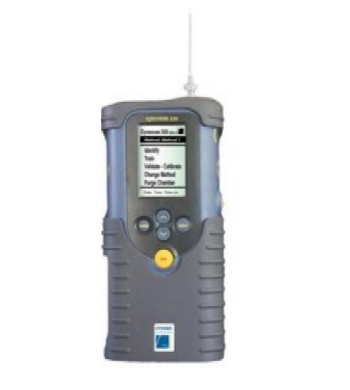 The Cyranose® 320 is a fully-integrated handheld chemical vapor sensing instrument designed specifically to detect and identify complex chemical mixtures that constitute aromas, odors, fragrances, formulations, spills and leaks. It is also used to identify simple mixtures and individual chemical compounds. The Cyranose® 320 is used in diverse industries including petrochemical, chemical, food and beverage, packaging materials, plastics, pet food, pulp and paper, medical research, and many more. The Cyranose® 320 utilizes the NoseChip® array of nanocomposite sensors and advanced pattern recognition algorithms to detect and recognize the chemical vapor of interest via its smellprint. In combination, these technologies enable rapid detection and identification of substances based on their chemical profile as visualized by the smellprint. The Cyranose® 320 also utilizes the versatile and intuitive PCnose software to “learn” the chemical profile of vapors of interest, enabling users to develop their own libraries of aromas, odors or the chemical characteristics of their own products. The PCnose software and NoseChip® array provide each customer with a unique capability – to learn and identify what is important about their own products – and thus utilize the same Cyranose® 320 instrument for many different sensing applications or instrument methods. For each method, the Cyranose® 320 provides simple, clear actionable results such as “Accept or Reject”, “Mixture Identified” or “Contaminated”. Each measurement is assessed a statistical quality rating of 1 to 5 stars. The intellectual property incorporated in the Cyranose® 320 is protected by over 60 patents in the United States and worldwide for the sensor technology, detector products, and applications use of the eNose. The following pages will describe our technology, products and applications. For more information please DOWNLOAD OUR DATASHEET or CONTACT US. We welcome your inquiries about the Cyranose Electronic Nose.